What is an eclipse and how can the gigantic sun be covered up by something so much smaller like the moon?What do animals think of all this?What did humans believe was happeningbefore we knew the scientific explanation?Try the experiment with the penny and see if the concept of an eclipse makes sense to you.This is another in the wonderful Let’s Read and Find Out Science series that can be just the thing for reluctant readers. This is another book in the "Let's Read and Find Out About Science" series that is so great to give to young male readers who really don't want to pick up a storybook. Okay, so just what is an eclipse? What happens up there in the sky to make the sun disappear or the moon get a ring around it? Take a penny...and see for yourself! 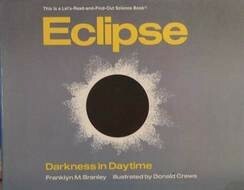 This book explains what happens during an eclipse and gives the young reader a method to experience it him/herself. Also, this book tells you how to watch an eclipse safely.